In the past year or so, it seems as though cartomizer tanks have become just about the hottest thing in the world of e-cigarettes. People seem to love the fact that cartomizer tanks make it possible for even the heaviest e-cigarette users to fill their e-cigarettes once at the beginning of the day and then forget about it, rather than adding e-liquid to an atomizer or cartomizer every few puffs. I find it difficult personally to review e-cigarettes with cartomizer tanks, though; although I know a lot of people love them, I don’t share that sentiment. I find that they always seem to result in significant compromises in flavor and vapor production compared to standard atomizers and cartomizers. The Halo Triton is the latest e-cigarette to forgo the standard pre-filled cartomizers in favor of a cartomizer tank, and although it works pretty well, it isn’t perfect. In my Halo Triton review, I’ll attempt to explain why. View the Halo Triton at Halo’s website. It costs $49.95 and is available in 11 different colors. If your order total exceeds $75, shipping is free. Use the coupon VAPE4LESS to save 5 percent on any purchase from Halo Cigs. In 2013, Halo released the Triton as a replacement for the old Halo Element e-cigarette, which was getting a bit long in the tooth. Although the Element was compatible with pre-filled cartomizers — which worked very well — Halo never got around to producing cartomizers filled with all of its different e-liquid flavors. This made it necessary to fill your own cartomizers, drip with an atomizer or use disposable plastic cartridges if you wanted to try all of Halo’s flavors. The Halo Triton requires self-filling, but doing so couldn’t be easier; simply twist off the mouthpiece and pour the e-liquid in. With a capacity of about 2 ml, the Halo Triton tank cartomizer holds about twice as much e-liquid as a standard cartomizer. Like Halo’s previous e-cigarettes, the Triton is available in a variety of colors. The battery also has a rubberized finish that makes the e-cigarette very easy to hold. Although the batteries in the kit have capacities of just 650 mAh each, replacement batteries are available with capacities up to 1300 mAh if you find yourself reaching for the charging cable too often. Since the cartomizer tanks included with the Halo Triton don’t draw a great deal of power, you should have no trouble getting the two included batteries to last through a full day of e-smoking. The Triton also includes an atomizer cone, and if you opt to use a high-draw attachment such as a low resistance atomizer you’ll find yourself charging the batteries a bit more frequently. I know that cartomizer tanks tend to mute flavors. They’re so large that, by design, there’s quite a bit of distance between your mouth and the heating element that creates vapor. To paint the Halo Triton in the best possible light, I filled the two cartomizer tanks with strongly flavored e-liquids — Alien Visions Boba’s Bounty and Halo’s own Midnight Apple. I’ll begin my Halo Triton review with two very serious compliments; first, the small 650 mAh batteries lasted far longer than I expected them to. In occasional use, it took me days to drain them. Compared to the cartomizers I’m accustomed to, the tank cartomizers included with the Halo Triton use power very efficiently. I think that even many heavy smokers won’t feel the need to upgrade to larger batteries. I also love how easy the tank cartomizers are to fill. For example, I have always found the acrobatics required to fill the tank cartomizer included with the Volcano Inferno a bit ridiculous; you have to fill the cartomizer fully with a syringe before loading the tank, or e-liquid won’t feed from the tank to the cartomizer. After you’ve done that, the cartomizer will only last a few weeks before you’ll have to repeat the process with a new cartomizer. With the Halo Triton, removing the mouthpiece and filling the tank directly makes for a far more user-friendly experience — and neither of my Halo Triton tanks has leaked even one drop of e-liquid. On the other hand, the tank included with the Inferno has two heating coils working in tandem to counteract the large size and reduced airflow of the tank, while the Halo Triton doesn’t have this feature. This means that the Inferno actually gives you an experience a bit closer to that of using a standard atomizer or cartomizer. 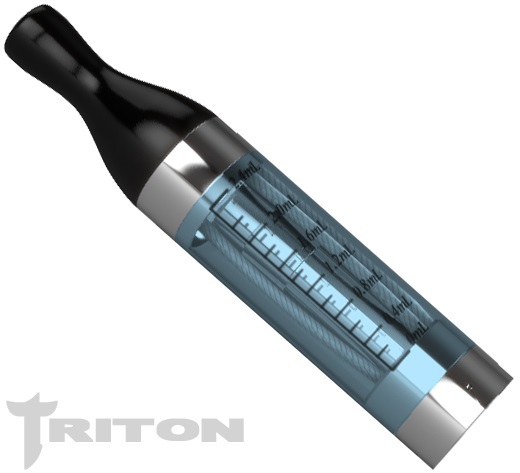 In comparison, flavors and vapor production on the Triton seem a bit muted. Even puffing twice in a row without pausing, I’m unable to get the full range of flavors out of my e-liquids that I know they possess. While I’ve cited the muted flavor of the Halo Triton’s cartomizer tank as a negative about the e-cigarette, it has to be said that people without extensive e-smoking experience probably won’t notice this fault — and the nicotine hit that you’d derive from e-smoking isn’t lessened at all. I simply know from experience that the e-liquids I used for testing are a bit more flavorful than what I experienced with the Halo Triton. View the Halo Triton at Halo’s website. It costs $49.95 and is available in 11 different colors. If your order total exceeds $75, shipping is free. 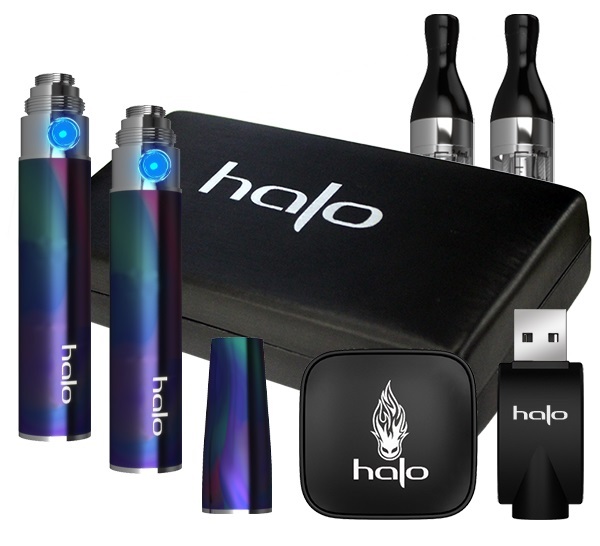 Use the coupon code VAPE4LESS to save 5 percent on any purchase from Halo Cigs.